Since the early 1890’s, Rowlands have been supplying Shrewsbury and the surrounding areas fresh produce. It is widely known that Rowlands will go above and beyond to source ingredients for customers, and often fulfil orders with products that are not normally stocked to ensure that chefs are happy. It is not often though, that something arrives in the depot that gets everyone talking. However, at the end of April, Rowlands took delivery of two very unusual fruits. The special order isn’t something that is often seen around the depot, which got everyone a bit excited! 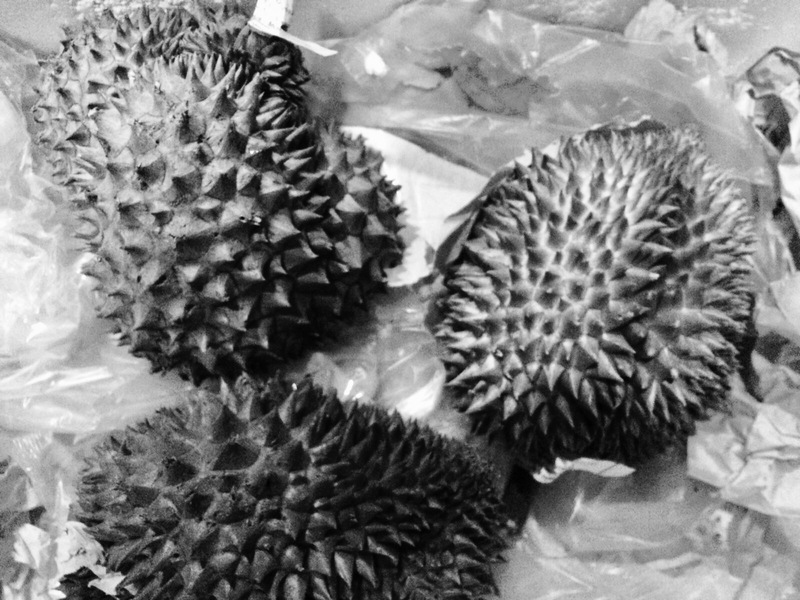 The dragon egg shaped Durian Fruit has such a pungent aroma, that it had to be kept in a separate part of the depot. The Durian Fruit is native to Malaysia, Indonesia and Brunei, but the biggest exporter of this strange fruit is Thailand, where it is believed it was introduced, however, may have grown there natively too. This tropical fruit holds much controversy because of its pungent odour and relatively high price. Whilst it looks similar to the Jackfruit (which features later in this story) the two are completely unrelated. The Durian Tree needs tropical conditions to bare its fruit, and will stop producing fruit when the mean temperature drops below 22 degrees C. In many South East Asian hotels and transport networks, the Durian Fruit is banned because of its characteristic smell. Even despite all of the controversies surrounding the Durian Fruit, it remains popular in Thai, Malaysian and Chinese cooking, and is regarded as a delicacy in such cultures. The Durian Fruit has, for many years, been available in Chinese supermarkets up and down the country, but for many of us, the taste, texture, and of course, that aroma, is a mystery. Those who try the unusual fruit definitely have a love/hate relationship with it. The odour given off by the fruit varies in description (although this could be because there are so many different varieties of the Durian Tree, and therefore the fruit it produces) – some people regard the smell as being very pleasant and even sweet, whereas others have likened the odour as being similar to raw sewage or vomit. The hard and spikey outer shell of the Durian fruit encases a cream coloured sweet custardy pulp, which can be used in a variety of sweet and savoury dishes. Apparently, if you can get over the intense smell of the Durian Fruit, the rewards of the custardy pulp are worth it. The Jackfruit came into Rowlands on the same day as the Durian Fruit, and by all accounts, was much more pleasant to be around! The rugby ball shaped fruit has been photographed next to a Kiwi fruit for a sense of perspective. The Jackfruit comes from the Jackfruit Tree, and is native to South and Southeast Asia – and is believed to have originated in South-western Rainforests of the Western Ghats in the Indian Subcontinent. The Jackfruit is one of the largest fruits around, some reaching a massive 80lb in weight and up to 35 inches in length and 20 inches in diameter. The Jackfruit Tree produces a record 100-200 fruits a year and is the national fruit of Bangladesh. Rather than being one large fruit, the Jackfruit is made up of hundreds of small flowers, the fleshy petals are the edible part of the Jackfruit. This tropical fruit has a distinctive flavour and texture; the flavour, a combination of apple, banana, mango and pineapple has a texture similar to that of a ripe banana. The Jackfruit can be harvested as both a completely ripe fruit and “green” fruit before it has ripened. The green jackfruit is used for savoury dishes, its versatile nature means that it can be a good meat substitute for vegetarian or vegan diets. Its meat like texture is similar to poultry, although the green jackfruit flesh has been used for pulled pork style dishes, fillings to tacos and burritos and as a topping for flatbread – all in place of Pork, Beef and Lamb. The Jackfruit is a versatile and easy to grow tree, requiring little maintenance. It is able to thrive in hostile conditions and is a good possibility as a sustainable food source in countries such as Africa where crops are often killed off in such environments. The Durian Fruit and Jackfruit were ordered into Rowlands as a special delivery for a client who was hosting an “I’m a celebrity – get me out of here” style event, and is one of the many examples that Rowlands have of searching out specialist items when required by clients. If you would like to order something out of the ordinary – give our sales team a call to discuss your requirements.